The tradition of crafting Icons in Russia goes back a long time. Apparently it all began sometime around the year 988 A.D. It was then that Orthodox Christians occupied much of Russia, and they took their religion and their art very seriously. There were very strict rules for making these icons in the old days, but the end result was the same as today; something that could be hung on a wall in a home or church that people could look to everyday as a reminder of their faith. Many people also pray to or in the vicinity of their icon on the wall. It was not until the 17th century that this traditional art form gained outside influence from Protestants and Catholics from Europe. This marked a turning point in Russian religious art; no longer were the rules followed so closely, artists were more free to express their creativity through religious motifs just as long as they remained non-blasphemous. Today artists and monks alike in Russia are still carrying on this age-old tradition of icon making. Here at The Russian store we have compiled an exquisite collection of authentic Russian icons that is sure to have just what you are looking for. 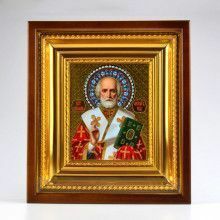 In our stock we have a little bit of everything: we have traditional Orthodox icons, we have contemporary icons, we have travel shrines, and we even have several antique icons. 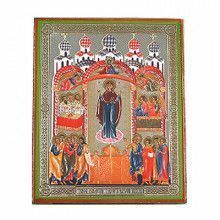 All of our new imported Russian icons were made by monks who work and live in Sofrino Monasteries. These icons and crosses are a subtle, tasteful way to display your faith in your home while adding a fine piece of art as well. 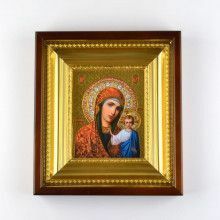 These icons also make a great gift idea, and they are perfect for collectors of religious art, antiques, or just anything Russian. Our antique icons are each one-of-a-kind and they are perfect for that special someone who has everything under the sun.